You might think that there is just ONE major governing body that sets all the standards and regulations for motorized vehicles, but that’s not the case at all. There are numerous national and worldwide agencies which make it their business to test and evaluate every component that goes into the production of just about anything. And while the results don’t equate to laws, there is a strong tendency in the industry to heed the advice. Some organizations like SAE are non-governmental; some are state and federal agencies that wield the power and demand lawful compliance. Extreme Tactical Dynamics makes sure that our products not only meet, but exceed the standards set by several of these agencies regarding emergency lights. The Society of Automotive Engineers (SAE) is an esteemed group of highly qualified scientists and engineers who volunteer their time to conduct research and establish design requirements for almost every part of aerospace and ground vehicles. The 128,000 international members develop test procedures, set guidelines, and performance requirements, but they are not a governing agency. They set and revise thousands and thousands of standards as the industry evolves. Two examples of these are the SAE-J595 and SAE-J845 Standards, both common to emergency lights. The first deals with the general requirements for flashing warning lamps for use on authorized emergency, maintenance, and service vehicles. The standard provides very specific guidelines covering every flashing feature of a light. The SAE-J845 relates to the photometric test procedure, and deals with the optical warning device class definitions that differentiate between omnidirectional and selective coverage devices. The emergency lights of ETD exceed both of these standards. The California Code of Regulations is a state agency with muscle; it’s the toughest around. Title 13 for Motorized Vehicles is subdivided into many sections, each covering a specific area. Division 2--Department of California Highway Patrol (CHIPS); Chapter 2-- Lighting Equipment, and finally Article 22--Warning Lights brings us to Emergency Vehicle Light regulations. The CCR Title 13, Article 22 requires 70 flashes/minute minimum for emergency vehicles. 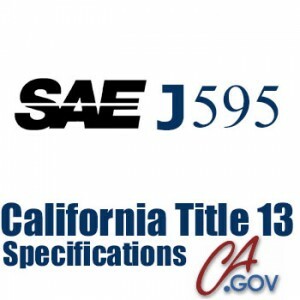 There are specific color requirements for Class A through E for California as well. California has devised its codes, as has every state, that regulate just about everything. ETD follows California’s Title 13-Article 22 lead in setting the standard of excellence for its strobe lights because many states use California’s high standard as their own. CENELEC was created by the European Community to ensure a safe environment for its citizens both in the private and public sectors. CENELEC is a nonprofit technical organization set up under Belgian law. It was created in 1973. The EU is committed to improving both society and business; they believe that adhering to standards and ratings protect workers, consumers, and the environment. They realize that high-quality products ensure efficient, high-performance output which supports trade and economic success. One such EU standard that ETD guarantees for its emergency lights is the IP-67 rating which sets the parameters for particle and moisture contamination of a product. If a produce has a ‘67’ rating that means that it’s sealed to keep out particles like dust and dirt even at high wind speeds. It also classifies a product as waterproof to a depth of 1 meter (39.37 inches) if submerged. Superior emergency lights meet or exceed this rating for they MUST efficiently operate under all diverse situations AND through all kinds of weather conditions. The National Fire Protection Association (NFPA) has over 9,000 volunteer committee members with a wide range of professional expertise which make up over 250 Technical Committees. It creates its codes and standards through consensus which includes the decision-making process, openness, balanced interest-groups, and fairness. More than 300 codes and standards cover everything related to fire, electrical, and hazard incidents, as well as, first responders, victims, buildings, etc. anything associated with potential emergency situations. Their guidelines and standards are recognized and adopted nationally and worldwide. The NIJ, the National Institute of Justice, falls under the United States Department of Justice. It develops policy and standards in the areas of policing, corrections, forensic research, and other related areas of law enforcement. The agency funds research in these areas providing recommendations and guidance based upon their findings. Keeping officers safe on the road and tools to increase their visibility is high on their agenda because of the ever increasing deaths of traffic officers in the line of duty. The NIJ funded research looking specifically at retroreflective striping, high-visibility paint, built-in lighting and other reflectors on emergency vehicles and published their findings. This is just one example of how the NIJ makes a real difference, and while they do not have the mandate to make laws, the highly credible, research-driven guidelines carry a lot of weight in the automotive light industry. The NFPA, like the SAE, and the NIJ are composed of dedicated volunteer professionals who devote many hours to developing codes and standards that try to protect us. Manufacturers and designers constantly stay on top the of the most recent information available from these agencies and often include the recommendations into their newest first responder products. Following the rules or suggested guidelines is often looked upon as tiresome and not worth the effort, but when it comes to saving lives, protecting the first responders both professionals and volunteers and our communities, too, it becomes a ‘no-brainer.’ The codes, standards, and laws are made, based on expert research, by dedicated individuals who value high-quality, superior products that will do the job in worse-case situations. Volunteer agencies don’t make laws; federal and state governments do, but the suggestions made by these agencies have proven invaluable to the industry.